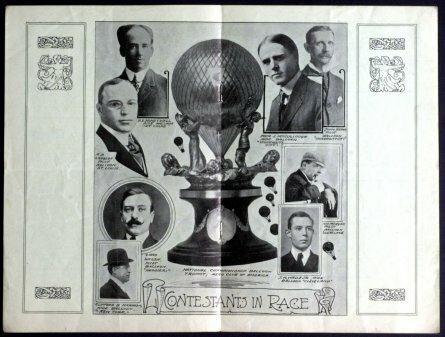 Programs from *1909 through May of 1910 are 10" long x 6 3/4" wide except for the June 5, 1909 Balloon Race which is narrower, with most having page numbers. The cost was ten cents. 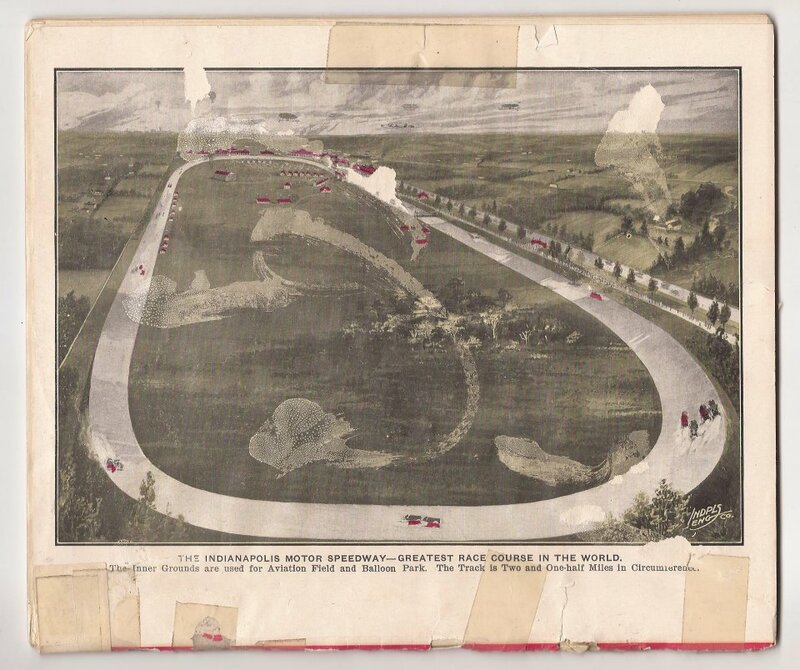 The first "race" at the Speedway was a balloon race held June 5th of 1909. Only about 3500 spectators paid to get in (another 40,000 watched from outside the track for free) to watch the American Aero Club Championship making this program extremely rare. The program is printed in only two colors and is four pages long counting the front and back of the pages but not counting the printing on the inside of the front and back covers. There are no page numbers. Note that Speedway President Carl Fisher is one of the "Men Prominent in Aeronautics". 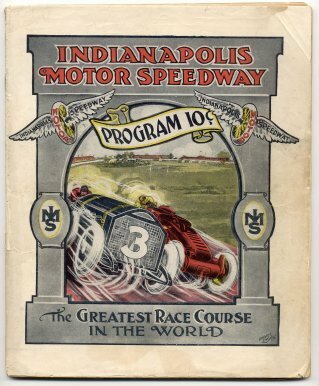 The back cover is similar to those of the other 1909 programs as it features the road course version of the Speedway. The National Motorcycle Race Meet of August 13th & 14th 1909 featured the first motorized races held at the Speedway. 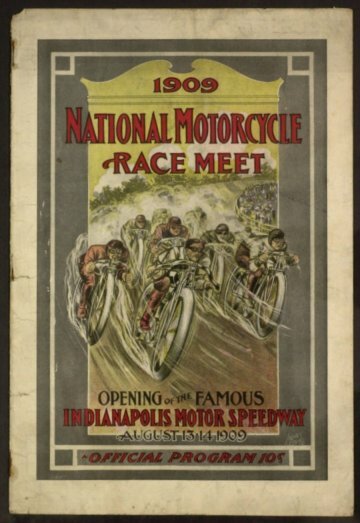 The overall low attendance (the second days races were called off due to accidents from poor track conditions) makes the National Motorcycle Race Meet program extremely rare. The back cover has an ad for G & J Tires instead of the aerial view of the track. The August 19th-21st auto races were far better attended than the motorcycle races of the week before, but the programs are still very rare. The Aug. 21st 300 mile final race was called at the 235 mile mark as several lives were lost in accidents due to the poor condition of the crushed stone and tar surface. There are programs for all three August race dates and the covers are the same with the August 21st cover shown below. There are at least two different programs for the Aug. 20th races where the covers are the same, but there is a different ad at the bottom of one entry page. It is uncertain if there are other versions of the 19th or 21st programs. 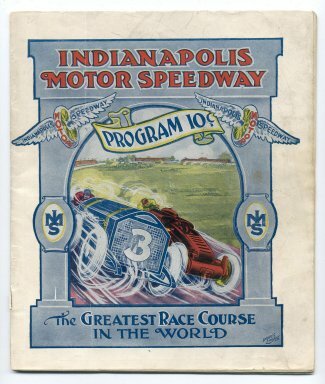 The front cover features the IMS wing and wheel logo at the top and “Greatest Race Course In The World” “Official Program 10c” at the bottom with a red car heading around a turn at center, will be the basic cover design for all programs in 1909 and 1910 unless noted. 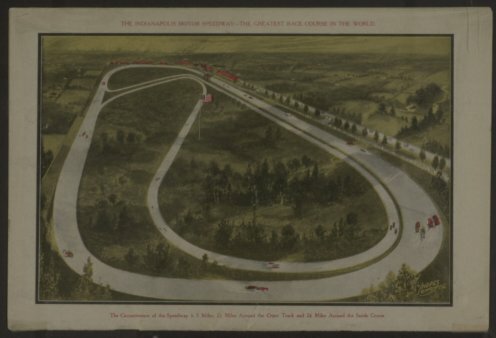 The back cover features an aerial view of the track with the road course in the infield which is very similar to several post cards issued at the time. Each days program has the full date i.e. August 19th, 1909, on the entry page(s) inside. There are no page numbers. At the top in red is written, “THE INDIANAPOLIS MOTOR SPEEDWAY - GREATEST RACE COURSE IN THE WORLD” and at the bottom “The Circumference of the Speedway is 5 Miles; 2 1/2 miles Around the Outer Track and 2 1/2 Miles Around the Inner Course.”. The one sheet program at right covers all the three days of auto races in August 1909. This is the only one of this type found to date and may be unique*. Note that the featured race each day had a letter designation that when the letters are put together they spell… wait for it….. IMS. 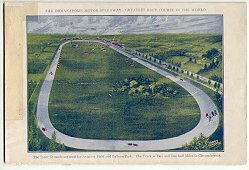 After the tragic August auto races, the track was paved with 3.2 million bricks - in 93 days! On December 17th-18th of 1909 there were Record Trials or sometimes called the "brick test" which consisted of record trials and a 20 mile race. Although it was a free event, below zero temperatures kept the attendance at maybe 500. The front and back covers are nearly identical to the August races except they they are a shade darker. The way to identify this from other similar program covers are the December 17th and 18th dates listed inside the program. Note the dates of December 17 and 18 on this partial page from the 1909 Speed Trials program. In 1910 there were several events scheduled: Memorial Day weekend, July 4th weekend and Labor Day weekend auto races, a June Aviation Meet and a September National Championship Balloon Meet. There are three programs from May 1910: May 27th, May 28th and May 30th. The covers of the Memorial Day programs are virtually identical to the August 1909 programs and again, with no dates to distinguish them, the way to tell them apart is by contents and the scoring/entry pages which are dated. The May 27th has an ad for Hudson and Clark Cars on page 17 and a Kurtz Magnetos ad on page 39. The May 28th and 30th programs have those two ads switched. The back cover is brighter like the August 1909 programs with the wording the same. The front and back covers remain the same with the color more like the August programs vs. the Record Trials program. The program size for the June Aviation Meet (June 13-18) changed to a more square 7 1/2" tall x 9 1/4" wide format with no date on the cover but it does have page numbers. 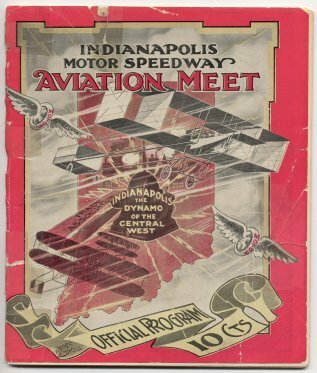 At the top of the front cover it reads, Indianapolis Motor Speedway Aviation Meet” with “Official Program 10 Cts at the bottom. In the middle, the state of Indiana is in the background and at center in front of a factory is a dynamo with the wording, “Indianapolis The Dynamo of the Central West” written on it. Two biplanes are above and below the dynamo with the words “Trade Association” in one of the streaks from the biplane below. Two IMS wing and wheel logos are at 10 and 4 o’clock. The back cover has a new aerial view with the road course now removed from the infield. Below the aerial track view now in black it reads, “THE INDIANAPOLIS MOTOR SPEEDWAY - GREATEST RACE COURSE IN THE WORLD” “The Inner Grounds are used for Aviation Field and Balloon Park. The Track is Two and One-half Miles in Circumference." 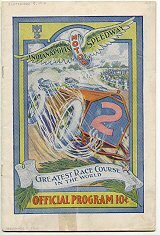 The "Indianapolis In The Limelight" program is a free program (note there is no price indicated) which is believed* to have been made to promote the Speedway and Indianapolis in 1910. This program was probably* printed and distributed after the June Aviation Meet but before August 12th (this may* be before the July races as those programs are the same tall narrow type with basically the same front and back covers like those seen in May). 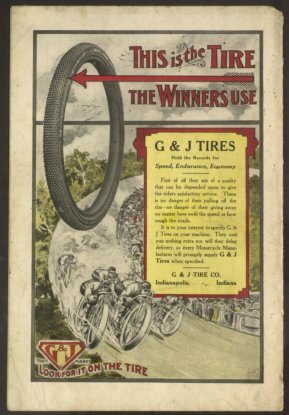 There is a Michelin tire ad on page 36 listing their accomplishments in 1910 so far with one of them being wins at Memorial Day races in Decatur Illinois. Also, there are no entry lists which would indicate it is not for a specific event. However, there is one picture of an airplane which states that it is at the Speedway which may or may not be from the June Aviation Meet. An August 12-13 24 hour race with a balloon meet to be held before the 24 hour race is listed but *due to dwindling crowds, both events were cancelled. 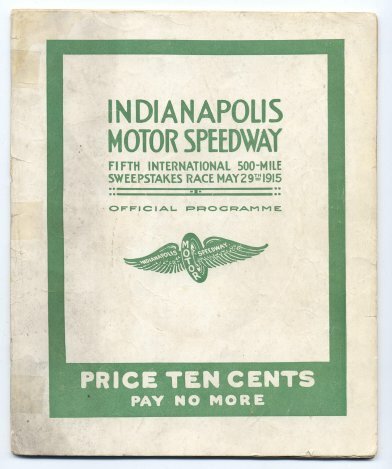 The cover does not say "Official Program" or "10 Cents" however, it does say "Indianapolis In The Limelight" at center between the two Wing & Wheel IMS logos. It is the same size as the June Aviation Meet program and there are 64 numbered pages. The back cover has a little brighter track view and the writing is in a different font than the Aviation Meet program. This program is a preview of what programs would look like, but that would have to wait until the September Labor day Auto Races were run. The July races were scheduled for July 1st, 2nd and 4th and there are programs for all three days. The cover is basically the same as the August 1909 and 1910 Memorial Day programs except it is a bit darker. The back cover is similar to the Aviation Meet program in coloration. 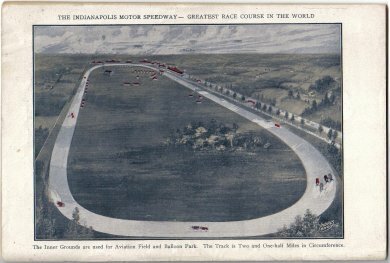 The Phrase “THE INDIANAPOLIS MOTOR SPEEDWAY - GREATEST RACE COURSE IN THE WORLD” is now at the top with “The Inner Grounds are used for Aviation Field and Balloon Park. The Track is Two and One-half Miles in Circumference." still at the bottom. The Labor Day Races were scheduled for September 3rd and 5th and there are programs for both days. The front and back covers are virtually identical to the July program except both are brighter. *It is believed there is a program for the Sept. 17, 1910 National Championship Balloon Meet as well. Of the known programs, the toughest are the 1909 Balloon Race, 1909 Record Trials, 1909 Motorcycle meet and the 1910 Aviation meet. Next are the 1910 July and Labor day programs. One will probably find an August 1909, May 1910 or Limelight program before you’ll find any of the others. 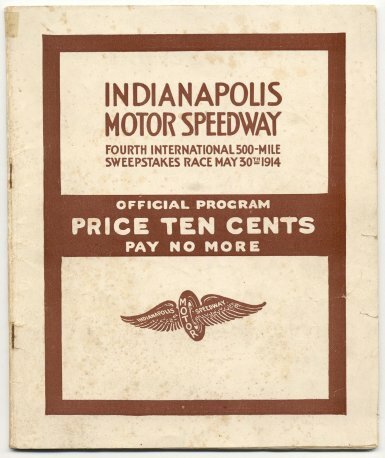 Attendance began to wane in the latter part of 1910 as the novelty of the Speedway wore off therefore these pre-'500' programs are very rare and hard to find. Carl Fisher and the other three owners of the Speedway agreed that they needed one special race for the Speedway. After debating various aspects for this special race, it was decided that a distance of 500 miles would be the best choice from all stand points. Memorial Day May 30, 1911 was chosen as the date for the inaugural Indianapolis 500. The cover for the first '500' program is seen below at left. It has no page numbers and can be distinguished from the 1912 by the gray border to the inner picture with a black and red car while the 1912 has a blue border with a blue and red car. 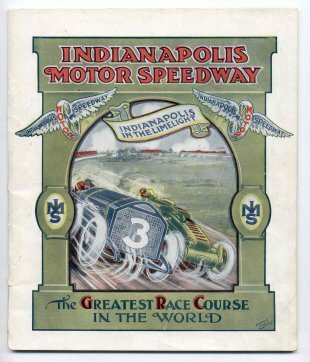 The size is the same 7 1/2" long x 9 1/4" wide format with no date on the cover like that of the 1910 Aviation Meet and "Indianapolis In The Limelight" programs. 1912 is again nearly identical to the 1911 with no date on the cover but there are page numbers. The 1913 cover is very close to the 1911 with it's gray border to the inner picture, but it's the first year for a '500' program to place the date on the cover (at bottom),"Official Program" at the top and have page numbers. On page twenty-two, an error was discovered regarding Joe Dawson’s time in the 1912 race which was corrected (note the "ERRATA..." to the left margin of pg. 22). It is not known how many were printed before the error was discovered or how many were corrected. The 1914, 1915 and 1916 programs are a change from previous years although bland in design comparison. The 1914 is brown and white, the 1915 green and white and the 1916 blue and white. All have the date on the cover and have page numbers. Beginning in 1914 the phrase "Price Ten Cents Pay No More" has been added to the cover in the middle and for 1915 and 1916 it moves to the bottom. The 1915 cover design changes slightly from 1914 with the 1916 cover design changing even more so along with a new wing and wheel logo appearing. 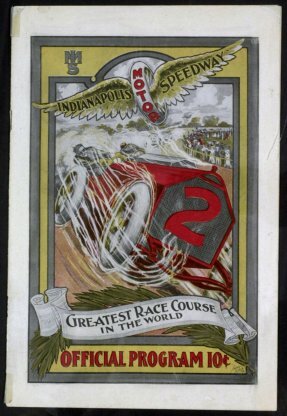 Due to the 1916 race being a 300 instead of a 500 mile race, the cover reads only as "Sixth Annual International Sweepstakes Race" with "500 Mile" removed. Two unusual prewar programs have surfaced. They are the 1914 First International W.D.A. Sweepstakes and the 1915 War in Indiana programs. The cover of the September 22, 1914 First International W.D.A. 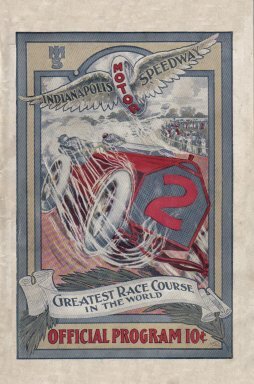 Sweepstakes is very similar to the 1915 Indianapolis 500 program with only the name and date of the event changed and the price removed. 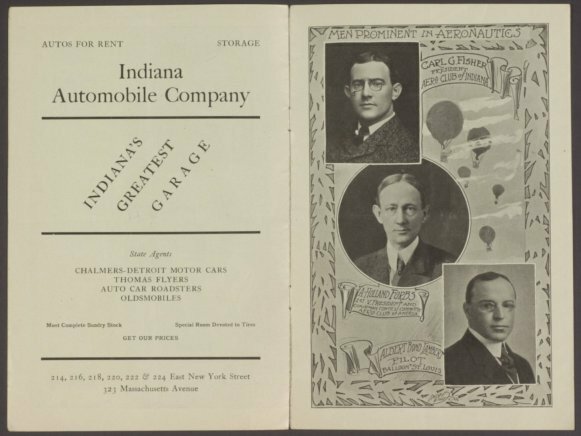 The Stutz ad on the back of the program mentions "visiting druggists" and with a little research, it was found that the W.D.A stands for the Wholesale Druggists Association which was founded in Indianapolis in 1876. More research determined that the names on the entrant list were the names of druggists. Since the race was courtesy of the Cole Motor Company, it is believed* the 11 drivers in the field were driving Coles, and were entered by the various druggists. The 1915 "War in Indiana" program is for a military tournament held September 6th, 1915 sponsored by the Indianapolis Armory Building Association. This organization was founded in August 1914 for the purpose of building the first Armory in Indianapolis for the National Guard. Speedway co-founder Carl Fisher was a member of the board and volunteered the Speedway for this event. All proceeds (note the program was “Ten Cents”) from the event were to be used to build the armory. Both programs are the same size but with fewer pages than the "500" programs of the same year. Not only are these two programs unusual, but they can be considered very rare with probably only a handful left in existence over one hundred years later. 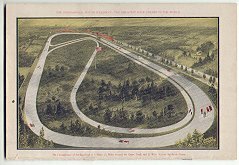 Due to the threat of the United States entering World War I and the possibility of the Speedway having to shut down, the Speedway decided to hold the "Harvest Auto Racing Classic" on Sept. 9th of 1916 which consisted of three races of varying lengths. No more than 10,000 spectators attended the event, therefore this is an extremely rare program to acquire. It is taller but narrower than the 1916 May program with a light tan cover with gold & black writing. 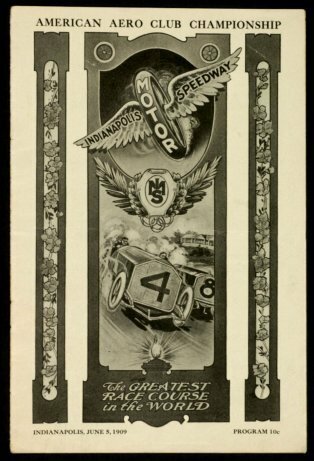 If the Harvest Auto Racing Classic program followed the same format as the May 1916 program, then it would have page numbers, but it is not certain whether it does or not. The phrase "Pay No More" was dropped from this program. Interesting to note that the 1915 "War in Indiana" event and the “Harvest Auto Racing Classic” were both held on September 6th. Noted Indiana poet James Whitcomb Riley even wrote a short verse across the hay stacks at lower left. 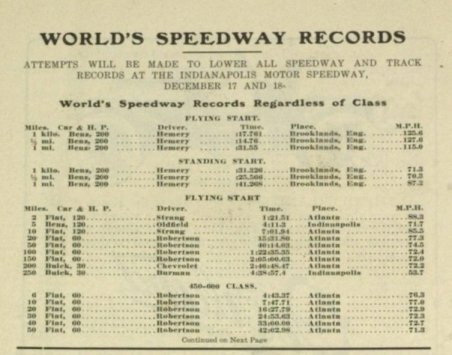 Attendance at the Speedway for the '500' events (the 1916 race was a 300 mile race due to several reasons) was better than ever, therefore programs are easier to find than the 1909-10 era programs but they are still very tough and rare to find. The toughest to find are the 1912 and 1916 followed closely by the 1911 with 1914 and 1915 about equal in toughness to find. Since the total number of errata and non-errata versions of the 1913 program is not known, it will be assumed equal numbers of both were made which would put the 1913 program in with the 1914 and 1915. Programs from this time period did have an issue with pages coming loose from the staples and as some of these programs have no page numbers, it can be hard to tell if pages are missing. One way to tell on 1911-1916 programs is with the 1911-1941 reprint programs (see the Reprints page for more info). As the staples are in the center, another way to tell on some programs is there may be an single company (such as Firestone) ad on both pages at the center. If it’s missing, there’s a chance other pages could be too. Look for evidence of pages with parts cut out or whole pages cut out as well. To learn more about the early days of the Speedway, we suggest reading "500 Miles to Go" by Al Bloemker. Much of the information about dates, attendance etc. for these early events were obtained from this book.